In a large bowl, add Semolina, Rice Flour and All Purpose flour. Add Salt, Asafoetida, Cumin Seeds, grated Ginger, Green Chillies and fresh chopped Coriander. Now, add water (2 & ½ cup approx.) and prepare liquidy batter like Buttermilk. Whisk until smooth without any lumps. Heat Tawa on medium to high flame. Mix the batter well before making dosa. With a ladle pour the dosa batter on Tawa. Drizzle some Clarified butter on the top and sides. Cook till the base is crisp and golden brown. Rava Dosa will take a longer time to cook than normal Dosa. Fold the dosa and take it out. 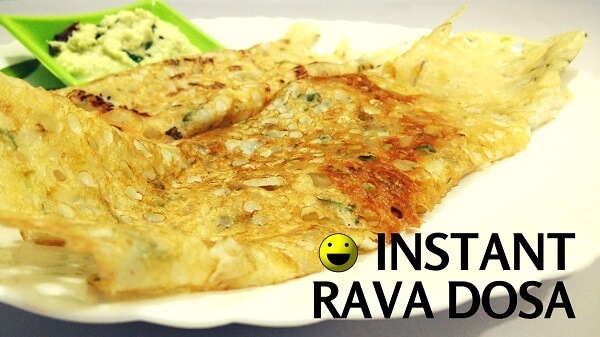 To make Onion Rava Dosa, spread some chopped onions on hot Tawa. 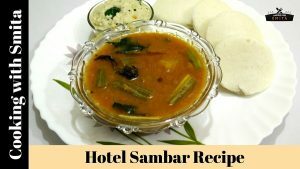 Serve Dosa with Coconut Chutney & Sambar.